Corporations can incur increasing levels of stress and tension along with the headaches of teamwork not taking place. Perhaps you are looking at building relationships with valued clients. At Royal Flush Hunting Lodge, we invite you to take some time and make some changes with your teams, groups, or corporation. Take a breather and see what we can offer your corporate getaway. We come pick you up from the airport which is only 15 minutes away whether you are flying with Delta or whether you are flying your own private jet. Build stronger bonds while working as a team to flush some pheasants out of corn strips, cattails, food plots, shelterbelts, CRP, and sloughs. After the hunt is over for the day, don’t worry about anything as we do all the bird cleaning, packaging, and freezing. 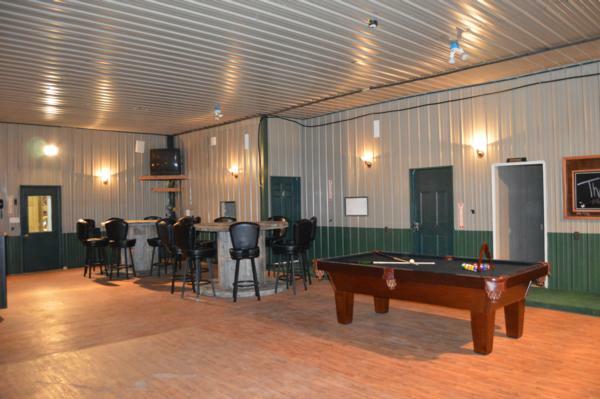 Release tension and stress by enjoying the amenities that we offer such as playing some pool, ping pong, darts, or cards at the end of the day while watching the big game in the rec room. Or just sit and relax in the lobby area with the fireplace going. Wifi is free as well for your personal or business needs. All of this can be done while enjoying the open bar. Sometimes the best ideas, plans, and innovations come when your mind is clear and the stress level is at its minimum. Downtime is a well-needed and deserved part of everyday life which comes a lot easier away from the office. Shoot some birds, grab some beers, and relax in South Dakota. Impress your clients, reward your staff, or just simply enjoy a company retreat to get away from the hectic lifestyles that occur. Let the staff at Royal Flush Hunting Lodge ensure that you have a memorable experience from the excitement of pheasant hunting to the amazing home cooked food. From Flights to Our Lodging - We have the Information your looking for! South Dakota is one of the highest pheasant populated states, if not the highest. It stands a reason as to why the ringneck pheasant has been named the state bird of South Dakota. It began a little over a century ago around 1908 when the pheasants were introduced into South Dakota, and since then they flourished thus starting the state pheasant season in 1919. Because of the massive amounts of pheasants, flights get booked months and months in advance by out-of-state hunters to ensure they make it here during the next pheasant season. The reason behind this is simple….habitat and wildlife management. There are endless fields of corn and soybeans along with an enormous amount of CRP land. Plus, there are countless food plots to entice and protect the birds even more. Not only do the lodges manage fields for the wildlife and habitat, many landowners are doing the same thing. In South Dakota, the possession limit per person is 15 roosters with a daily limit of 3 roosters. However, many lodges allow hunters to shoot extra roosters (normally with a fee). But what the heck, you are here anyways so why not enjoy it a little bit more by shooting more birds and keeping your skills in check. We have a few different seasons in South Dakota for pheasant hunting – early (preserve land), normal, and late (preserve land). Early season begins the first part of September until around the middle of October, normal season continues until around the end of December, and late season proceeds until the end of March. These different seasons allow for a variety of hunting methods, testing skill levels, and sometimes testing toughness levels as well. Whether you come to our lodge or a different lodge, you need to make it a point to visit South Dakota and see what we offer for pheasant hunting. Many hunters have been coming as grandkids and are now the grandparents bringing their kids and grandkids. You won’t regret the lands, the people, and most of all, the pheasants. Come on over and lets flush ‘em up!